Since we’ve been talking about pudding cakes lately, I thought I’d bump this one up. Some of you mentioned chocolate pudding cake could be made in a slow cooker, and I forgot I’d tried it. This is from 3 years ago and I’m going to file it in the new pudding cake category. Adapted from The Best Slow Cooker Cookbook Ever by Natalie Haughton, this Chocolate Orange Pudding cake seemed like the perfect dessert. But since my family is not too crazy about chocolate-orange, I made the recipe with a few modifications. The end result was a Slow Cooker Chocolate Mocha Pudding Cake – a cakey topped pudding not unlike a giant chocolate molten lava cake, but in this case, not so rich. In fact, according to my cooking software “Mastercook”, one serving of this has less than 30% fat. If you make the serving a little smaller and add a scoop of low fat ice cream, that will bring it down even more. 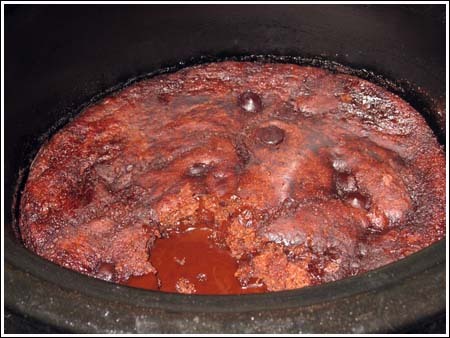 Spray inside of 3 ½ to 4 quart slow cooker with cooking spray or rub with butter. In another bowl, mix together brown sugar and remaining 1/4 cup cocoa powder. Sprinkle cocoa mixture over the batter, but do not stir it in. Pour the coffee evenly over all. Again, do not stir. Cover and cook on high heat for 1 3/4 to 2 hours or until a tester inserted in the top portion of the cake comes out clean. The inside should be hot and similar to fudge sauce. Spoon cake and sauce out of slow cooker and arrange next to or under a very cold scoop of ice cream. Or if you prefer, set the ice cream on top. When I make hot/cold desserts, I like to scoop out the ice cream a few hours ahead of time, and freeze the pre-formed scoops. When it’s time to serve the dessert, I just drop the ice cream scoop right on the plate without having to deal with scooping firm ice cream. This cake is very hot, so the ice cream will soften fairly quickly. Anna, how many servings does this cake make? And I mean real servings, not wimpy ones. Do you live above 3000 ft. altitude? In my home state (Colorado) where I’ve been cooking for nearly 60 years that is one of the first things we think of when baking. You’ll find plenty of information if you do a search for “high altitude baking”. Do you happen to know what brand of flour you used? If you used all the measurements above, then maybe it had something to do with the brand of flour. I’d try another brand or if you used bleached, try unbleached. If that doesn’t help, you may want to just add another 2 tablespoons flour. Wish I had a better answer for you. I made this recipe today and really liked it. Mine however didn’t have much cake parts, 90% gooey, 10% cake. Do you know what adjustment I could make to make it just a little more cakey? A touch more flour? Thanks for the recipe…easy to make and extremely decadent. This seemed so odd when I was putting it together, I was a little nervous…but boy did it ever get rave reviews! I have never yet gotten a bad recipe from here–you are definitely my go-to source for yummy cookies/desserts. Johnny, I posted a new picture. Emilie, you know, I think I’M a crackpot from the seventies. As for crockpots…or crock-pots, I don’t think anything bad would happen if you used your parents. This cake only cooks for 2 hour max, so if you cook it while you are at home you should be okay. I really want to make this again with a very high quality complex cocoa powder. wow, ive never heard of this! kinda looks like a huge creme brule. Everyone has a hobby, ours just happens to be baking. Would your husband make fun of you if you were a painter or a scrapper or a woodworker? It’s a relaxing pursuit and much cheaper than therapy. I eat small portions of things and give the rest away. Also, I balance whatever sweets and junk I eat with protein and vegetables. So yes, I bake and eat cookies every day, but I generally eat a big serving of steamed vegetables, an egg white omelet or grilled chicken and then maybe one or two cookies. My husband doesnt eat sweets during the day at all, but he likes having a small dessert after the evening meal. That’s how I get away with baking twice a day. Oh, and I exercise. But yes, I am always, always, always looking for an excuse to bake for other people. Somethings are harder to give away. For instance, there was no way we could eat the whole cherry dump cake. Believe it or not, this crockpot chocolate cake actually stayed good until the next day. I just left the remainder in the crockpot, covered it, and kept it on the counter. I just have to ask-do you and your family honestly eat all of the stuff you make, or do you give much of it away? I absolutely love to bake, but if I didn’t give lost of it away, I’d be morbidly obese, and desperately unhealthy. I often make very healthy muffins, etc. for my family, since I don’t like them to eat too much sugar, but we do have treats once in awhile (I’m in the middle of making a batch of chocolate biscotti right now). Just wondering how you deal with this issue. ? ?